Tag line: "Come stay at the Yankee Pedlar ... For a night you WILL NEVER FORGET"
The Yankee Pedler Inn, which has been in business for over a century, is closing its doors for good. The Inn’s two remaining employees, desk clerks Claire (Sara Paxton) and Luke (Pat Healy), who on Monday morning will be out of a job, decide to spend the entire weekend at the hotel, determined to prove once and for all that the place is haunted. With only a couple of other guests checked in, including former television star (and current spiritualist) Leane Rease Jones (Kelly McGillis), Claire and Luke should have plenty of time to track down the ghost of Madeline O’Malley, who, many years earlier, supposedly died after being locked away in the basement. Armed with the latest paranormal equipment, Claire, who’s working the night shift, wanders through the dimly-lit hallways and large, empty rooms of the hotel, waiting for Madeline’s ghost to contact her. As it turns out, she doesn’t have to wait very long. 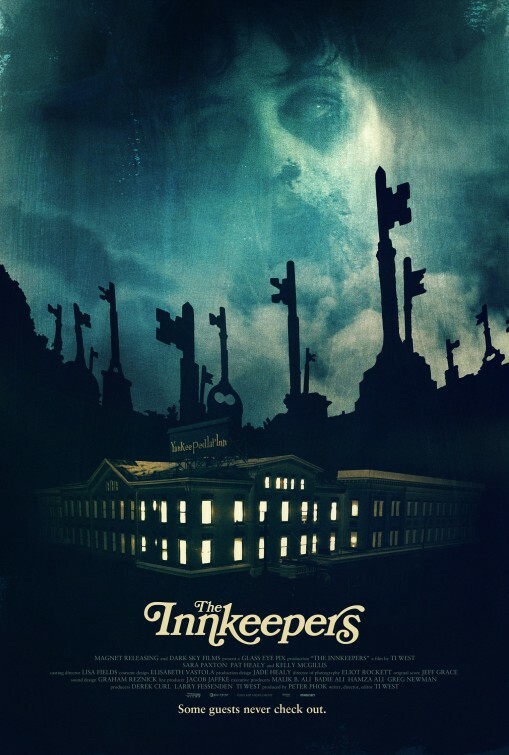 Once, during an interview, director Ti West said “I make regular movies that turn into horror movies”, and this is exactly how he approaches his 2011 film The Innkeepers, completely fleshing out his main characters before pitting them against the hotel’s unearthly forces. Claire, we learn, is an energetic, outgoing young lady who, despite being a bit flighty at times, worries about her future, especially since she never finished college, and it’s fairly obvious Luke is smitten with Claire, and is using the paranormal investigation as an excuse to get closer to her. By meticulously building the relationships and motivations of his protagonists, West ensures that, when Claire does have a ghostly encounter, it’s as shocking for us as it is for her. Many die-hard horror fans will undoubtedly be turned off by West’s careful pacing at the outset, but rest assured: the second half of the movie is filled with a sense of dread that rarely lets up. It may take a while to get there, but once The Innkeepers finally delves into the supernatural, it’ll have you on the edge of your seat. 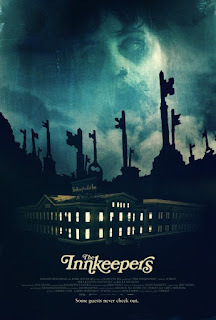 The Innkeepers does what a lot of horror films do not do. It makes you genuinely care about the characters and what happens to them, only adding to the suspense. I think Ti West is a phenomenal director and while this outing wasn't as amazing as The House of the Devil, it's still a worthy addition to his filmography. Great review. May have to rewatch it. Also, this is my quasi-promise to start commenting on here. I love your tweets and you always send me a FF so I need to give back some love. Subscribed and everything! @Nick: Sorry for the late reply! You're absolutely right about how West makes us care for the characters. This makes it even more creepy when things start falling apart for them at the end. I, too, lied HOUSE OF THE DEVIL, but this one impressed me just as much. And I look forward to reading more of your comments, and promise to reply in a more timely manner next time! Whoa! Thanks for recommending this one! I love a good ghost yarn, and this one is top-notch! The acting was excellent! Sara Paxton and Pat Healy were great! Especially Paxton. What a skilled actress. I'll have to look for more of her work.